Our wide selection of collectible music boxes lets you start every day with a merry melody! Shop our distinctive collection, featuring a variety of unique designs from renowned music box companies. Whether you're looking for a tender sentiment or a whimsical expression, we have all the music box gifts you need to send a song from the heart! 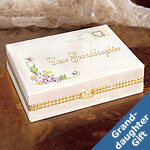 The best-known names in music boxes are all here at Collectibles Today! Buy sculpted treasures with Mr. Christmas music boxes that delight with vintage charm and incredible detail. The San Francisco Music Box Company showcases must-have designs inspired by pop-culture themes to delight any music box collector. Ardleigh Elliott music boxes feature heartwarming keepsakes with exclusive art that fill your home with joy. Looking for an original music box style? You'll find it right here! Discover a classic design and a gleaming finish with a wooden music box or browse animated carousel music boxes for something more playful. You can even find a Disney music box starring your favorite character. There's no better place to find the music boxes that fit your mood or style. Shop Now!